These images show the sudden appearance of bright aurora on Mars during a solar storm. The purple-white color scheme shows the intensity of ultraviolet light given off by aurora on Mars's night side before (left) and during (right) the event. A simulated image of Mars for the same time and orientation has been added, with the dayside crescent visible on the right. The auroral emission appears brightest at the edges of the planet where the line of sight passes along the length of the glowing atmosphere layer. 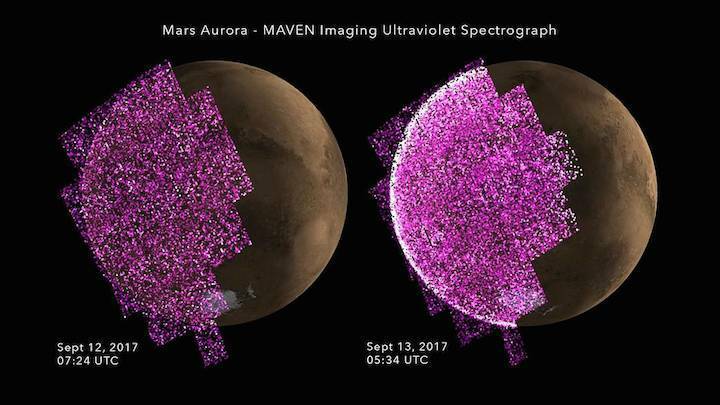 The Imaging UltraViolet Spectrograph on the MAVEN spacecraft obtained these images on 12-13 September 2017.